Had my second uni interview today in Staffordshire, centre of the ceramics. And couldn't resist doing abit of material shopping. I went to this large shop called potterscrafts, it will have ANYTHING you are looking for. I was looking for some materialistic inspiration. 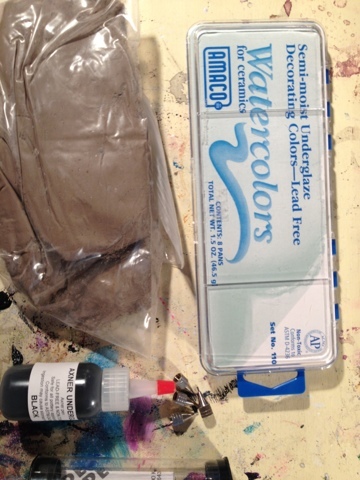 I then came across these Amaco semi-moist underglazes water colours for ceramics. Not cheap but can't wait to use them!! I also got an underglaze pen with changeable nibs. Come with a bold, med, fine and extra fine! And the kind lady gave me a sample of crank clay! Super excited to get these goodies out and get experimenting! Thats all for today, Oh yes... I have an interview at Brighton!! !